The Hotpoint Electric Heating Company, simply known as Hotpoint, was founded in 1911 in Ontario, California. As the creator of the first electric iron, Earl Richardson started the company as a way to sell his invention. Hotpoint, famous for its all-white products, manufactures a variety of home appliances. The company strives to be on the cutting edge of technology and energy efficiency with their products. Hotpoint may be a great company with solid products but even the best appliance can break. When your appliance breaks it’s time to call Action Appliance Repair for service you can rely on. Since 1961 our family-owned and operated business has been committed to making sure customers come first. Our service technicians are experts at what they do and provide courteous service no matter what kind of job it is. Many homeowners rely on generic service centers for their needs. At Action Appliance Repair, we are experts in Hotpoint appliances and have over 50 years of experience to back up this claim. Let us help you get your home back in order. When your Hotpoint appliance is causing you trouble or breaks, call us toll free at 866-611-4479. 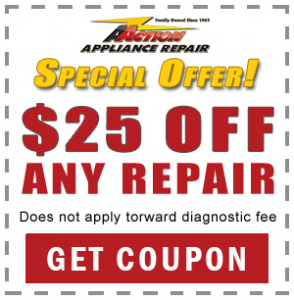 Here at Action Appliance Repair we are experts at what we do. Our trusted technicians will give you peace of mind that your appliance will be fixed to your high standard. We even provide your service call absolutely free. The next time your Hotpoint appliance breaks down or needs repair of any kind, call Action Appliance Repair for service you can depend on. We specialize in Hotpoint machines and our expert technicians will give you peace of mind that your appliance is in the best hands. Along with our excellent customer care, we proudly offer our customers a 5 year pro-rated parts warranty. So what does calling Action Appliance Repair for your Hotpoint appliance mean for you? We waive the fee of our service call if we repair your Hotpoint appliance. You won’t owe us anything if we visit and are able to repair your appliance.